Over the next few days, we'll be celebrating the 60th anniversary of Sydney Allard, Guy Warburton, and Tom Lush winning the Monte Carlo Rally in an Allard P1. The event started on Tuesday January 22, ending on Sunday the 27th. For those of you unfamilar with the classic Monte Carlo Rally, the event was a long distance road rally which emphasized navigation and timing on open roads as opposed to the special stage rally format we have today. 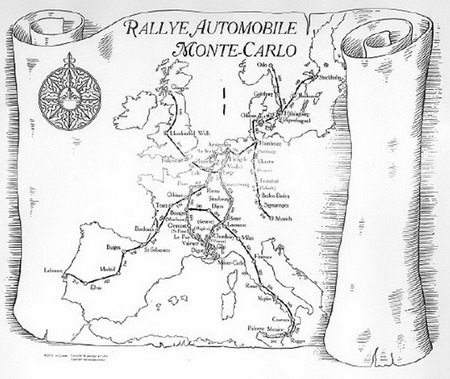 In 1952, competitors started the rally on Tuesday January 22 from select cities all over Europe. Start cities included Glasgow, Oslo, Stockholm, Munich, Palermo, Lisbon, and Monte Carlo. The Allard team chose to start from Glasgow because they felt it would provide the most favorable weather conditions en route to Monte Carlo. In 1952, the weather would play an important factor, with the Alps blanketed in thick snow the route would be treacherous. 328 teams started the rally...only 167 finished. In over 100 years, only 5 Britons have won the "Monte" and only one driver has won in a car bearing his own name. The driver and car were both named Allard.